Mr. Tony Difiglio began his journey in the yacht charter business in 1973 as a business owner of a manufacturing company searching for a unique venue to entertain his top clients. He chose the Summer Mist, one of the few yachts available for charter rental at that time. After five years of increasingly successful events, this 49 passenger vessel was going to be sold. Realizing the success of his events and receiving a little nudge from his colleagues, Tony Difiglio bought the Summer Mist to continue hosting his clients. Docked at Burnham Harbor, Tony and his wife Anita decided to rent out the Summer Mist to other business owners and interested parties. Tony quickly realized that not only was this charter rental successful, but that there was a demand for hosting larger groups as well. In 1981, Tony sold the Summer Mist and purchased a 90 foot, 127 passenger yacht and named it the Anita Dee after his wife, Anita Difiglio. With this purchase, Tony began his second business, Tee Dee Enterprises, Inc, dba Anita Dee Yacht Charters. Originally docked at Burnham Harbor, the Anita Dee moved to Navy Pier in 1986, companion to only one other charter vessel docked at the Pier. Both Tony and Anita attended school to become Coast Guard certified captains and spent endless hours visiting conventions and bureaus, building awareness and excitement about this new idea to view the Chicago skyline, entertain clients or show appreciation to employees. The Anita Dee also offered individual ticket sales for one hour sightseeing cruises. These cruises served the tourism industry and as a means of advertising along the lakefront. After ten years of steadily increasing business, frustrations of having to turn down larger groups and talks of returning Navy Pier to its previous glory of convention and tourism hosting, Tony and Anita decided to build another vessel. In 1990, Tony and Anita spent the last two months of the fourteen-month construction in the Florida shipyard customizing each and every detail of this new vessel, to be named the Anita Dee II, after their daughter Anita Difiglio, Jr.
Docked on the north side of Navy Pier, this 140 foot, 400 passenger vessel, fully equipped with a piano lounge, formal seating for 120 guests and a helicopter ornamented observation deck was largely successful from the beginning. In 1992, both the Anita Dee and the Anita Dee II were moved to the south side of Navy Pier. Averaging 180 private charters per year, Anita Dee Yacht Charters has served over a million guests including some of the highest dignitaries in the world, actors, musicians, radio and television stations. Proudly offering their yacht to convention, corporate, wedding, social and not-for-profit groups of 50-400, Anita Dee Yacht Charters has become a very successful business for more than thirty years. Today, Anita Dee Yacht Charters continues to be an industry leader in innovation and customer focus. The decision was made to begin the 2014 season by moving both vessels to our brand new private and exclusive docking location at Dusable Harbor . 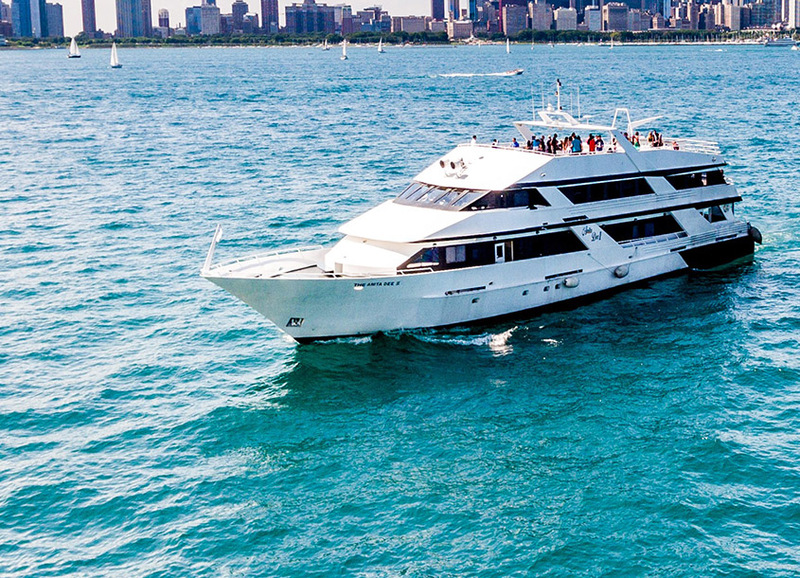 Docked in the heart of downtown Chicago on the Chicago River at Lake Shore Drive, both vessels will continue to offer exclusively private charters allowing each group to select the date, time, direction of travel, location of embarkation and décor. Anita Dee Yacht Charters began as a small business on the side, run by a husband and wife and continues today to be a family run and owned enterprise with daughter Anita and grandson Anthony Junior both holding prominent positions within the company. For over 30 years we have provided the best the industry has to offer for our clients. We look forward to many more years ahead.